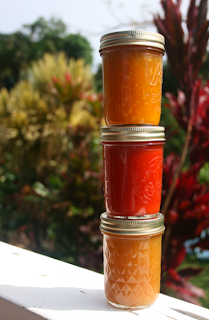 Orange marmalade, guava jam and lemon marmalade. When do I sleep you ask? Good question seeing as I was up until well after 1:00 AM yesterday making Guava Jam. But this is what I love to do... creating something new. And a week before that it was Lemon Marmalade and the week before that was Orange Marmalade. Which one on toast? How do I choose? I can't have more than one open at a time... or one will surely go bad. To date I have made the following jams... in order of my personal preference. Looking forward to a Surinam Cherry when those are in season and a Pineapple too. I just had a thought... you'll have to wait and see if it makes it past the test kitchen. Every single one of your fruit preserves sounds positively mouthwateringly delicious! © W. Conn Brattain and John R. Giordani. Blog Design J. Giordani + C. Brattain. Picture Window theme. Powered by Blogger.